Throughout the years, Woodland Farms has not only contributed to Iowa agriculture, but the Hermansons also fostered relationships in the international farming community as well. 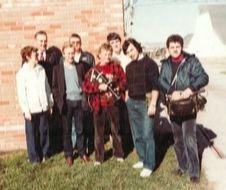 In the last 50 years, Woodland Farms has hosted visitors from from countries such as Germany, Brazil, Argentina, China, and many more. Through collaboration with Iowa State University's agriculture program and other Iowa farming organizations, Woodland Farms showcased the characteristics of successful midwest farmers to international visitors. 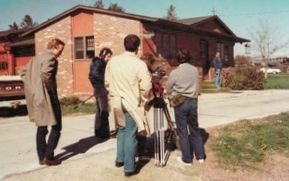 1984: French public television filmed a documentary at Woodland Farms. A French film company was making a documentary based on Alexis De Tocqueville's book De La Démocratie en Amérique, or Democracy in America. A French man, De Tocqueville, traveled to the United States in 1831 to observe democracy in America and the relationships between American citizens and governing systems. Woodland Farms was filmed to highlight free enterprise in America, which is a substantial section of Tocqueville's Democracy in America. Every international visitor or their collaborating organization would write a letter expressing the gratitude felt with every trip to Woodland Farms. Many visitors were directed to Woodland Farms through Iowa State University's Agriculture school, which has collaborated with Woodland Farms for many years. The Hermanson family always displayed immense hospitality for their foreign guests, and even still keep in contact with some today! 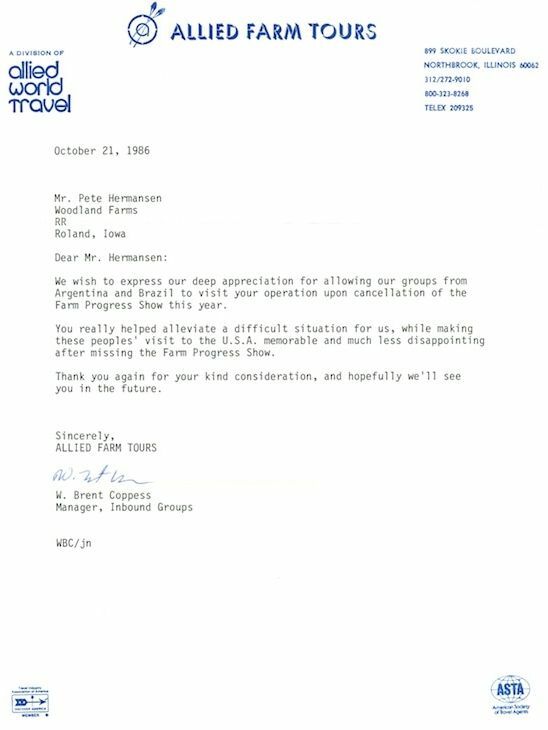 1986: Woodland Farms hosted Argentinean and Brazilian farmers due to the cancellation of the Farm Progress Show. 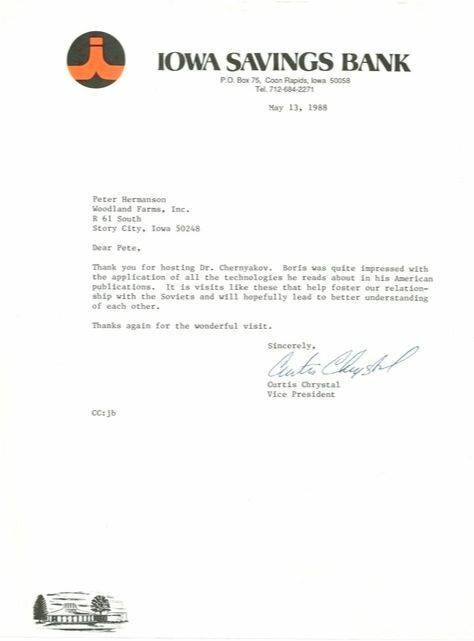 1988: Woodland Farms hosted Boris Chernyakov, a top adviser to the Russian Federation's Ministry of Agriculture. 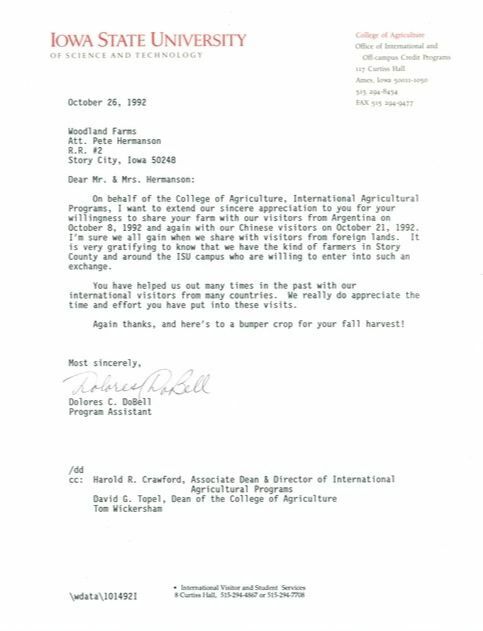 1992: Woodland Farms hosted Argentinean and Chinese visitors in collaboration with the Iowa State University College of Agriculture. 1995: Woodland Farms hosted employees of Fleming Wendeln Landhandel, a feed production company from Garrel, Germany. Left to right: Marissa Heers and Katherine Foerster, Janet Hermanson, Pete Hermanson, Cornelio de Rooy. September 14, 1994. 1994: Janet and Pete Hermanson hosted Cornelio de Rooy, a 23-year-old student from Brazil. de Rooy was a member of the International Young Farmer Training Program, which allowed him the opportunity to learn American farming techniques after graduating from the Federal University of Parana with a degree in agronomy engineering. de Rooy primarily came to America to work on his English skills, which he considered the universal language of farming. After his 8 month stay with the Hermanson's, he would return to Brazil to manage 20,000 acres of undeveloped farmland. 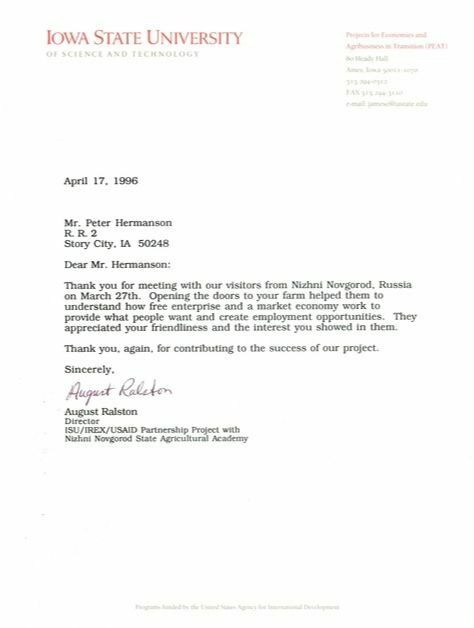 1996: Woodland Farms hosted visitors from Nizhni Novgorod, Russia in collaboration with the Iowa State University College of Agriculture. This visit allowed the Russian guests to observe American free enterprise and market economy. 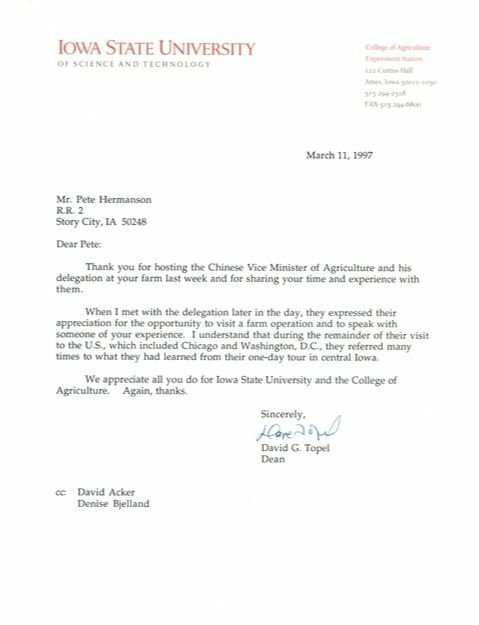 1997: Woodland Farms hosted the Chinese vice Minister of Agriculture in collaboration with Iowa State University College of Agriculture.